Residents of the province of Quebec in Canada, Nordic peoples, Finns, Estonians, Baltic peoples, Russians, Poles, Germans, Belarusians, Neopagans. Marks the ancient middle of Summer, astronomical beginning of Summer, and the nativity of St. John the Baptist. Midsummer, also known as St John's Day, is the period of time centred upon the summer solstice, and more specifically the Northern European celebrations that accompany the actual solstice or take place on a day between June 19 and June 25 and the preceding evening. The exact dates vary between different cultures. The Christian Church designated June 24 as the feast day of the early Christian martyr St John the Baptist, and the observance of St John's Day begins the evening before, known as St John's Eve. European midsummer-related holidays, traditions, and celebrations are pre-Christian in origin. They are particularly important in geographic Northern Europe – Sweden, Denmark, Norway, Finland, Estonia, Latvia and Lithuania – but is also very strongly observed in Poland, Russia, Belarus, Germany, Netherlands, Ireland, parts of the United Kingdom (Cornwall especially), France, Italy, Malta, Portugal, Spain, Ukraine, other parts of Europe, and elsewhere – such as Canada, the United States, Puerto Rico, and also in the Southern Hemisphere (mostly in Brazil, Argentina and Australia), where this imported European celebration would be more appropriately called "Midwinter". Midsummer is also sometimes referred to by some Neopagans as Litha, stemming from Bede's De temporum ratione which provides Anglo-Saxon names for the months roughly corresponding to June and July as se Ærra Liþa and se Æfterra Liþa (the "early Litha month" and the "later Litha month") with an intercalary month of Liþa appearing after se Æfterra Liþa on leap years. 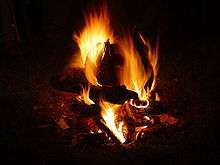 The fire festival or Litha – Summer solstice – is a tradition for many neopagans. In Wicca, practitioners celebrate on the longest day and shortest night of the year which has not had a set date since the retirement of the 13-month Celtic calendar. The celebration of Midsummer's Eve (St. John's Eve among Christians) was from ancient times a festival of the summer solstice. Bonfires were lit to protect against evil spirits which were believed to roam freely when the sun was turning southward again. In later years, witches were also thought to be on their way to meetings with other powerful beings. The solstice itself has remained a special moment of the annual cycle of the year since Neolithic times. The concentration of the observance is not on the day as we reckon it, commencing at midnight or at dawn, as it is customary for cultures following lunar calendars to place the beginning of the day on the previous eve at dusk at the moment when the Sun has set. 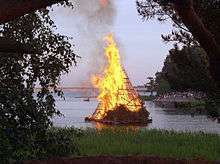 In Sweden, Finland, Latvia and Estonia, Midsummer's Eve is the greatest festival of the year, comparable only with Walpurgis Night, Christmas Eve, and New Year's Eve. In the 7th century, Saint Eligius (died 659/60) warned the recently converted inhabitants of Flanders against the age-old pagan solstice celebrations. According to the Vita by his companion Ouen, he'd say: "No Christian on the feast of Saint John or the solemnity of any other saint performs solestitia [summer solstice rites] or dancing or leaping or diabolical chants." The fires, explained the monk of Winchcombe, were to drive away dragons, which were abroad on St. John's Eve, poisoning springs and wells. The wheel that was rolled downhill he gave its explicitly solstitial explanation: "The wheel is rolled to signify that the sun then rises to the highest point of its circle and at once turns back; thence it comes that the wheel is rolled." On St John's Day 1333 Petrarch watched women at Cologne rinsing their hands and arms in the Rhine "so that the threatening calamities of the coming year might be washed away by bathing in the river." On Midsummer day Bulgarians celebrate the so-called Enyovden. On the same day the Eastern Orthodox church celebrates the day of John the Baptist and the rites and traditions of both holidays are often mixed. 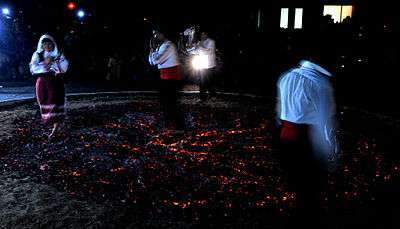 A fire-related ritual is also performed in Bulgaria on that day, it involves barefoot dance on smoldering embers and is called Nestinarstvo. Bulgarian folklore states the beginning of summer starts on Enyovden. It is thought that in the morning of Enyovden, when the sun rises, it "winks’ and "plays". Anyone seeing the sunrise will be healthy throughout the year. It is believed that on Enyovden a variety of herbs have the greatest healing power, and that this is especially true at sunrise. Therefore, they have to be picked early in the morning before dawn. Women–sorceresses and enchantresses go to gather herbs by themselves to cure and make charms. The herbs gathered for the winter must be 77 and a half – for all diseases and for the nameless disease. It has been celebrated since the times of the Vikings by visiting healing water wells and making a large bonfire to ward away evil spirits. Today the water well tradition is gone. 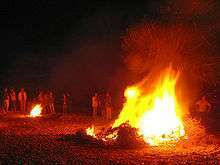 Bonfires on the beach, speeches, picnics and songs are traditional, although bonfires are built in many other places where beaches may not be close by (i.e. on the shores of lakes and other waterways, parks, etc.) 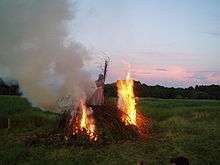 In the 1920s, a tradition of putting a witch made of straw and cloth (probably made by the elder women of the family) on the bonfire emerged as a remembrance of the church's witch burnings from 1540 to 1693. This burning sends the "witch" away to Bloksbjerg, the Brocken mountain in the Harz region of Germany where the great witch gathering was thought to be held on this day. Some Danes regard the relatively new symbolic witch burning as inappropriate. Since 1955, the holiday has always been on a Saturday (between June 20 and June 26). Earlier it was always on June 24. Many of the celebrations of midsummer take place on midsummer eve, when many workplaces are closed and shops may close their doors at noon. 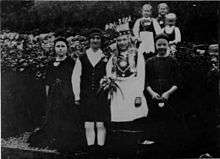 In folk magic, midsummer was a very potent night and the time for many small rituals, mostly for young maidens seeking suitors and fertility. Will-o'-the-wisps were believed to appear at midsummer night, particularly to finders of the mythical "fern in bloom" and possessors of the "fern seed", marking a treasure. In the old days, maidens would use special charms and bend over a well, naked, in order to see their future husband’s reflection. In another tradition that continues still today, an unmarried woman collects seven different flowers and places them under her pillow to dream of her future husband. An important feature of the midsummer in Finland is the white night and the midnight sun. Because of Finland's location spanning around the Arctic Circle the nights near the midsummer day are short or non-existent. This gives a great contrast to the darkness of the winter time. The temperature can vary between 0 °C and +30 °C, with an average of about 20 °C in the South. Many Finns leave the cities for Midsummer and spend time in the countryside. Nowadays many spend a few days there, and some Finns take their whole vacation in a cottage. Rituals include bonfires, cookouts, a sauna and spending time together. Heavy drinking is also associated with the Finnish midsummer. Many music festivals of all sizes are organized on the Midsummer weekend. It is also common to start summer holidays on Midsummer day. For many families the Midsummer is the time when they move to the countryside to their summer cottage by the sea or lake. 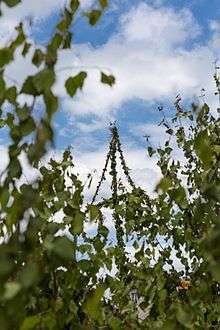 Midsummer is also a Finnish Flag Day where the flag is hoisted at 6 pm on Midsummer's Eve and flown all night till 9 pm the following evening. Finnish Canadians in the New Finland district, Saskatchewan, Canada celebrate Juhannus. On June 21 Hungarians celebrate "Saint Ivan's Night" (Szentiván-éj) (Iván derived from the Scandinavian form of Ivar, translated as Jovános, Ivános, Iván in Hungarian). The whole month of June was once called the Month of St. Ivan until the 19th century. Setting fires is a folklore tradition this night. Girls jumped over it, while boys watched the spectacle. 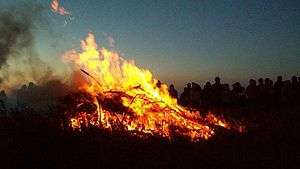 Most significant among the customs of the summer is lighting the fire of Midsummer Night (szentiváni tűzgyújtás) on the day of St. John (June 24), when the sun follows the highest course, when the nights are the shortest and the days the longest. The practice of venerating Saint John the Baptis developed in the Catholic Church during the 5th century, and at this time they put his name and day on June 24. The summer solstice was celebrated among most peoples, so the Hungarians may have known it even before the Hungarian conquest of the Carpathian Basin. Although the Arab historian Ibn Rusta speaks of the Hungarians' fire worshipping, so far there is no data that could connect it to this day. In the Middle Ages it was primarily an ecclesiastical festivity, but from the 16th century on the sources recall it as a folk custom. The most important episode of the custom is the lighting of the fire. Tiregān (Persian: تیرگان‎‎) is one of ancient Iranian festival coinciding with the mid summer festivals, another midsummer festival is Gilaki Bal Nowrooz which is held in the north of Iran. Midsummer is commonly called John's Day (Joninės) in Lithuania, and is also known as Saint Jonas' Festival, Rasos (Dew Holiday), Kupolė, Midsummer Day and St. John's Day. 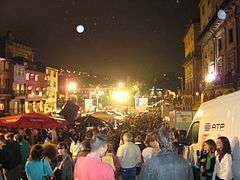 It is celebrated in the night from the 23rd of June to the 24th of June and on the 24th June. The traditions include singing songs and dancing until the sun sets, telling tales, searching to find the magic fern blossom at midnight, jumping over bonfires, greeting the rising midsummer sun and washing the face with a morning dew, young girls float flower wreaths on the water of river or lake. These are customs brought from pagan culture and beliefs. The latter Christian tradition is based on the reverence of Saint John. Lithuanians with the names Jonas, Jonė, Janina receive many greetings from their family, relatives and friends. Ivan Kupala was the old Kyiv Rus' name for John the Baptist. Up to the present day, the Rus' Midsummer Night (or Ivan's Day) is known as one of the most expressive Kyiv Rus' folk and pagan holidays. Ivan Kupala Day is the day of summer solstice celebrated in Ukraine and Russia on June 23 NS and July 6 OS. Before the day was named for St John, this was a celebration of a pagan fertility rite involving bathing in water. 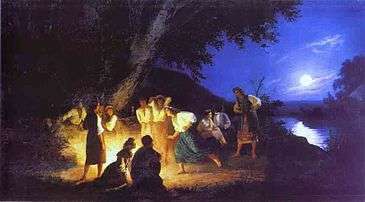 Since St John the Baptist's birth is celebrated at this time, some elements of Kupala's pagan origins were seen to be roughly synonymous with Christian meanings, most notably the parallel of Baptism as cleansing from sins, so the holiday in a Christian-modified form has been accepted into the Orthodox Christian calendar. In modern times, due to increasing secularization, it is possible to find Kupala being celebrated in a manner closer to its pagan roots. In Slovenia so called Kresna noč used to be celebrated on June 21., but during Jugoslavia holiday was changed with maj. 1, international workers day. Kresna noč used to be connected with Slavic god Kresnik, who was later replaced by St. John the Baptist. Medicinal plants: Traditionally, women collect several species of plants on St. John's eve. These vary from area to area, but mostly include fennel, different species of fern (e.g. dryopteris filix-mas, osmunda regalis), rue (herb of grace, ruta graveolens), rosemary, dog rose (rosa canina), lemon verbena, St John's wort (hypericum perforatum), mallows (malva sylvestris), laburnum, foxgloves (digitalis purpurea) and elder flowers. In some areas, these are arranged in a bunch and hung in doorways. In most others, they are dipped in a vessel with water and left outside exposed to the dew of night until the following morning (o dia de San Xoan -St. John's day), when people use the resulting flower water to wash their faces. 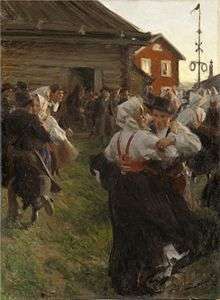 In Sweden Midsummer's day is a Saturday between the 20th and 26th of June, but as is usual in Sweden the actual celebration is on the eve, i.e. a Friday between the 19th and 25th of June. Midsummer's Eve is a de facto public holiday in Sweden with offices and many shops closed. June 24, Midsummer Day, the feast of St. John the Baptist, is one of the quarter days in England. In recent years on the Summer Solstice, English Heritage has run a "Managed Open Access" to Stonehenge for the Summer Solstice celebrations. Midsummer celebrations held throughout the United States are largely derived from the cultures of immigrants who arrived from various European nations since the 19th century. In Shoreland, The Fire Department holds a "Summerfest" with rides, games, and live music on the Saturday of Midsummer. As forms of Neopaganism can be quite different and have very different origins, these representations can vary considerably, despite the shared name. Some celebrate in a manner as close as possible to how they believe the Ancient Pagans observed the tradition, while others observe the holiday with rituals culled from numerous other unrelated sources, the Germanic culture being just one of the sources used. In Neo-druidism, the term Alban Hefin is used for the summer solstice. The name was invented by the late 18th century Welsh Romantic author and prolific literary forger Iolo Morganwg. Midsummer, or Litha, is part of the reconstructed Germanic calendar used by some Germanic Neopagans. In modern times, Litha is celebrated by neopagans who emphasize the reconstruction of Anglo-Saxon Germanic paganism. ↑ Morrill, Ann (2009). Thanksgiving and Other Harvest Festivals. Infobase Publishing. p. 19. ISBN 1438127979. ↑ Polon, Linda (1983). The Whole Earth Holiday Book. Good Year Books. p. 192. ISBN 067316585X. ↑ "Was Jesus Born on December 25". Allaboutjesuschrist.org. Retrieved 2012-07-15. 1 2 Birt, Hazel Lauttamus (1988). "New Finland Homecoming 1888 – 1988" (republished online by Saskatchewan Gen Web Julia Adamson). Retrieved 2010-12-07. ↑ For Neolithic and Bronze Age astronomy, see Archaeoastronomy. ↑ Petrarch, Epistolae familiares, Aachen,21 June 1333, noted by Simon Schama, Landscape and Memory 1995:265. ↑ Jens Kristian Lings (23 June 2010). "Heksene ødelægger vor dyrebare natur | Kristeligt Dagblad". Kristeligt-dagblad.dk. Retrieved 2012-07-15. ↑ "Suomalaisen kirjallisuuden seura: Juhannuskokko". Finlit.fi. Retrieved 2012-12-25. ↑ "Suomalaisen kirjallisuuden seura: Koivunoksia ja maitoruokia". Finlit.fi. Retrieved 2012-12-25. ↑ "Suomalaisen kirjallisuuden seura: Juhannussalko". Finlit.fi. Retrieved 2012-12-25. ↑ Snyder, Russell. (2014-06-16) Enjoying Midsummer the Finnish way – thisisFINLAND. Finland.fi. Retrieved on 2014-06-21. 1 2 "Suomalaisen kirjallisuuden seura: Juhannus, miksi ja milloin?". Finlit.fi. Retrieved 2012-12-25. ↑ interviews by Julia Adamson (27 Aug 2010). "New Finland District, Juhannus: Celebration of Summer,June 26, 2010, Saskatchewan, Canada". Saskatchewan Gen Web. Retrieved 2010-12-07. ↑ Grimm, Jacob (1883). Teutonic Mythology, Volume 2. George Bell & Sons. p. 619. ↑ "Szent Iván éj". Fn.hu. Retrieved 2012-12-25. ↑ "Latvian town to mark summer solstice with naked run". Iol.co.za. 2007-06-20. Retrieved 2012-12-25. ↑ "Alho-porro: significado quase desconhecido". TSF. Retrieved 2015-06-24. ↑ "Sabe como nasceu o martelinho do São João?". Dinheiro Vivo. Retrieved 2015-06-24. ↑ Margaret Read MacDonald (1992). The Folklore of World Holidays. ↑ "Blic Online | SPC i vernici danas obeležavaju Ivanjdan". Blic.rs. Retrieved 2012-07-15. ↑ Theodore Erbe (editor) (1905). Mirk's Festial: a Collection of Homilies, Kegan Paul et al., for the Early English Text Society, p.182, accessed 15 December 2014 at Internet Archive. ↑ Midsummer – Mobilising the world to enjoy the magnificence of Midsummer. Midsummer.mobi (2013-06-20). Retrieved on 2013-07-06. ↑ Gwyl Ifan 2013. Gwylifan.org. Retrieved on 2013-07-06. ↑ "Summer Solstice Celebration: History". Retrieved 2010-06-21. ↑ "Merchant Information". Retrieved 2008-06-24. ↑ Owen, William (1832) A Dictionary of the Welsh Language: Explained in English; with Numerous Illustrations.